News, commentary, articles and opinions on back pain, neck pain, sciatica, herniated discs and various treatment options... with a sprinkle of controversy, humor and miscellaneous tidbits thrown in just to keep it interesting. I’m 90% certain I’m going to get a laptop now that Christmas is over. That is, providing the prices drop in the next couple of weeks. There have been some real bargains lately, but I’m still putting if off — not only because of prices — but because I’m not sure which one to get. I keep going back and forth between different models. I almost bought a 15” Dell a couple weeks ago. They had a good deal on their lowest priced model. For $499 it came with 1 Gb of ram, a 120 Gb hard drive and Win XP but… just as I was about to buy it… they changed the deal. They stripped it down to 512 Mb Ram and a 60 Gb hard drive. Needless to say, that just ticked me off and I decided to look elsewhere. Then I happened across a deal on a refurbished Gateway for only $349. Normally I wouldn’t consider a used machine but it was from a reputable dealer that I often buy parts from. Decided the next day to get it only to find that they raised the price to $399. You can sometimes find new laptops for $399 so it didn’t make sense to spend that much on a used one. For a while I was thinking about one of the 17” models, but they’re just too big and they’re kind of expensive. One nice thing I like about the Eee is that it runs on Linux instead of Windows and comes with an office suite called OpenOffice, which is compatible with MS Office documents. Kind of hard to beat that. Also, it will boot up in under 30 seconds and shutdown only takes 10 seconds. In other words, it’s a pretty snappy little PC. The main problem with the Eee is that it only has a 7” screen and the keyboard is rather tiny. Some people say you can get used to typing on the miniature keyboard, but it isn’t ideal for more than just note taking. You wouldn’t want to use it to write your dissertation. Numerous reports of problems with the sd card reader. The 7” screen only allows you to see about 18 lines of text. Horizontal scrolling is often required to view certain websites. Finally, the small size is not as convenient as it first sounds. Most people find they can’t work on the thing in their lap without putting a book or something under it to make it more stable. The only way to use it is if you’re at a desk. I think Asus made a mistake downsizing the keyboard as much as they did. It really wasn’t necessary. 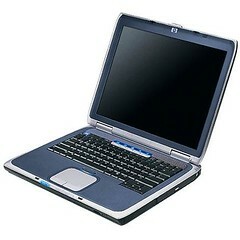 My old Compaq 486 notebook (mentioned above) has a 7” screen, measures about the same dimensions as the Eee PC and has a smaller than normal keyboard that is not noticeably miniaturized. So they could have built a small laptop without using a teeny tiny cramped keyboard. What I’d like to see is a low cost ultra-portable with a 10-12” screen and normal size keyboard. 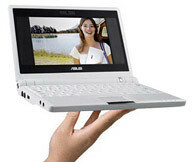 It should come with the same basic specs as the Asus, that is 600 to 900 Mhz processor, 512 Mb of Ram (expandable to 2 Gb), 4-8 Gb of solid state memory, 3 USB ports, an sd card slot, LAN, WLAN and VGA ports. Bundle it with Linux, OpenOffice and Firefox and it would be a winner. Also, they need to do away with the fan. It should be a totally silent PC. It doesn’t have to be a speed demon. Linux runs faster than Windows and works fine on a slower, cooler, less expensive CPU. 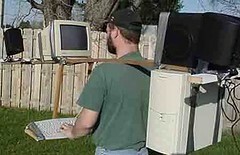 I know that there are some ultra-portables out now with many of these features, but they are very, very expensive. The Asus prices start at $349. My reasons for wanting a laptop are purely practical. For example, I find myself AFK (i.e. Away From Keyboard) a lot lately, which is why my blog posts have been few and far between. Anyway, that’s my plan for the coming new year. We’ll see if it comes to fruition and I can start boring you to death with more of my idle ramblings. Hope you’re enjoying the holidays. If not, go buy yourself something. You deserve it. Survived the ice storm that hit the Midwest this weekend. According to the news; over one hundred thousand people without power just to the North and West of where I live. I’m feeling very fortunate to be snug and warm here in my little hovel with ol’ sleepyhead. Woke up Sunday to an Ice Crystal Palace outdoors and was going to snap a few photos for you, but it was so warm that it melted off before I could get that done. They did get about 3/4 of an inch over in Oklahoma (to the West of Missouri). But we only got around an 1/8 to 1/4 in this area. Enough to bring down some power lines, but nothing like we had last year. Well, better get back to work. Knowledge is the key to success... and nowhere is this more apparent than in the task of rebuilding your back. There is a great deal of misinformation floating around out there about back and neck pain and most of it exists only because we as patients and consumers have not taken the time to educate ourselves. This site is dedicated to helping you rectify that situation. Is Your Bad Back a Medical Problem? Which Doctor For Back Pain? Should You Try Cold Therapy? Is Microdiscectomy Right For You? Do You Have a Slipped Disc? Don't I Need a Chiropractor? Can TENS Provide Back Pain Relief? The information in RebuildYourBack.com is not intended as a substitute for professional medical help or advice but is to be used only as an aid in understanding spinal rehabilitation. A physician should always be consulted for any health problem. RebuildYourBack.com provides links to other organizations as a service to our readers and is not responsible for the information, services, or products provided by these web sites, health professionals, or companies. See Terms and Conditions.